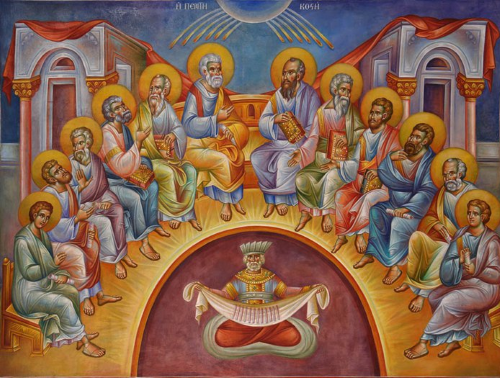 The Feast of Holy Pentecost is celebrated each year on the fiftieth day after the Great and Holy Feast of Pascha (Easter) and ten days after the Feast of the Ascension of Christ. The Feast is always celebrated on a Sunday. The Feast commemorates the descent of the Holy Spirit upon the Apostles on the day of Pentecost, a feast of the Jewish tradition. It also celebrates the establishment of the Church through the preaching of the Apostles and the baptism of the thousands who on that day believed in the Gospel message of salvation through Jesus Christ. The Feast is also seen as the culmination of the revelation of the Holy Trinity. Read more on the Orthodox Church in America website. Saturday of the Souls liturgy for Pentecost will be held on Saturday, June 3, 2017 starting at 9:30am. Saturday of Souls is a day set aside for commemoration of the dead within the liturgical year of the Orthodox Church. Saturday is a traditional day for prayer for the dead, because Christ lay dead in the Tomb on Saturday. Bring kollyva (boiled wheat) if you can but even if you can’t bring the names of your deceased loved ones anyway. We will hold a memorial service for them after the Divine Liturgy. 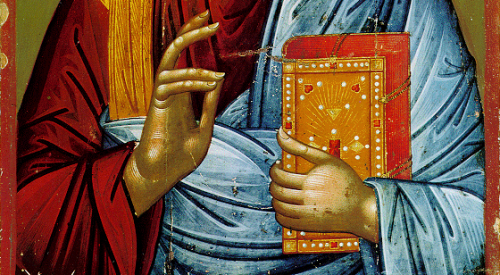 The Kneeling Prayers for Pentecost will be said following the Divine Liturgy this Sunday. Would you like to read the entire bible? Would you like to take on this challenge with friends for encouragement and support? On September 1, the start of the new Church Year, St. Peter’s will start a program to read the bible in one year. Information will be posted on the website in August. Start thinking about it now. Where there are no labors, there are stagnation and the extinction of the sparks of life [despondency]. The Christian prays while he walks, while he talks, while he rests, while he works or reads: and, when he meditates alone in the secret retreat of his own soul, and calls upon the Father with groans that are no less real because they are unspoken, the Father never fails to answer and draw near to him. I know a man who kept no long strict fasts, no vigils, did not sleep on bare earth, imposed on himself no other specially arduous tasks; but, recollecting in memory his sins, understood his worthlessness and, having judged himself, became humble – and for this alone the most compassionate Lord saved him; as the divine David says: ‘The Lord is near to them that are of a broken heart; and saves such as be of a contrite spirit’ (Ps. 34:18). In short, he trusted the words of the Lord and for his faith the Lord received him. Of course, when someone is ungrateful, he cannot recognize the love of God. Ingratitude is a great sin. Walk before God in simplicity, and not in subtleties of the mind. Simplicity brings faith; but subtle and intricate speculations bring conceit; and conceit brings withdrawal from God. How should we pray for the sick? Remember them daily. Say their names (first names are sufficient) and ask God to bestow mercy and grace on them. Add or remove names and print this list for easy reference during your prayer time on the St. Peter website. Their voice has gone out into all the earth. The heavens declare the glory of God. When the day of Pentecost had come, the Disciples were all together in one place. And suddenly a sound came from heaven like the rush of a mighty wind, and it filled all the house where they were sitting. And there appeared to them tongues as of fire, distributed and resting on each one of them. And they were all filled with the Holy Spirit and began to speak in other tongues, as the Spirit gave them utterance. On the last day of the feast, the great day, Jesus stood up and proclaimed, “If anyone thirsts, let him come to Me and drink. He who believes in Me, as the Scripture has said, ‘Out of his belly shall flow rivers of living water.’” Now this He said about the Spirit, which those who believed in Him were to receive; for as yet the Spirit had not been given, because Jesus was not yet glorified. When they heard these words, many of the people said, “This is really the prophet.” Others said, “This is the Christ.” But some said, “Is the Christ to come from Galilee? Has not the Scripture said that the Christ is descended from David, and comes from Bethlehem, the village where David was?” So there was a division among the people over Him. Some of them wanted to arrest Him, but no one laid hands on Him.